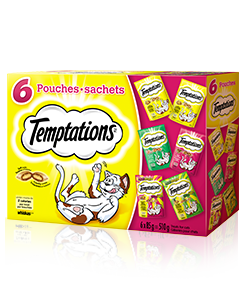 Mouth-watering, 6-pack variety of flavours your feline friend craves. No artificial flavours. 100% nutritionally complete for adult maintenance. A selection of 2xSavoury Chicken, 1xSeafood Medley, 1x Hearty Beef, 1xMix-ups Meaty and 1xMix-ups Catnip. 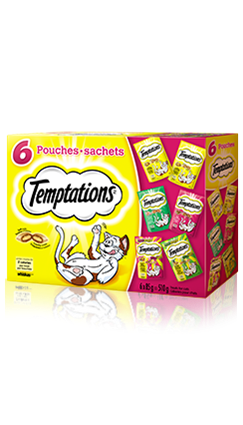 TEMPTATIONS® Variety Pack is rated4.9 out of5 by8. Rated 4 out of5 byBenji fromAmazing productsI started buying these treats a few weeks ago. My cat goes crazy for them. I am happy to have finally found something that he enjoys so much. He is very picky and we have tried what seems like everything over the last few years and it's nice to finally have something that he loves. Thanks you so much !!! Rated 5 out of5 byMama fromHave to have this on hand!My cat couldn’t mak it through her day without the routine of getting her treats. Don’t dare run out sp get the big variety pack. Rated 5 out of5 byJen7 fromGood stuffBoth my boys love these treats . We buy them all the time! 2 x Savoury Chicken 85g: For Nutrition Information Click Here. 1 x Seafood Medley 85g: For Nutrition Information Click Here. 1 x Hearty Beef 85g: For Nutrition Information Click Here. 1 x Mix-ups Meaty 85g: For Nutrition Information Click Here. 1 x Mix-ups Catnip 85g: For Nutrition Information Click Here.